Five years ago when I got back into photography and started being serious about it, I loved wide-angle lenses. I didn’t have a lot of money, but a superwide lens was on my wishlist. Back then I wasn’t quite as experienced and mature, and I’ve noticed how my compositions have grown and become better, as well as finding my own style. Wide-angle lenses are a tricky breed and most photographers don’t understand how to (in my opinion) use them properly. Nothing applies to wide-angle lenses like that old Robert Capa quote. As my style developed (hurr durr, photography joke) I became less and less interested in superwide-angles. Since I became more and more interested in portraits and people, I became more interested in longer lenses. 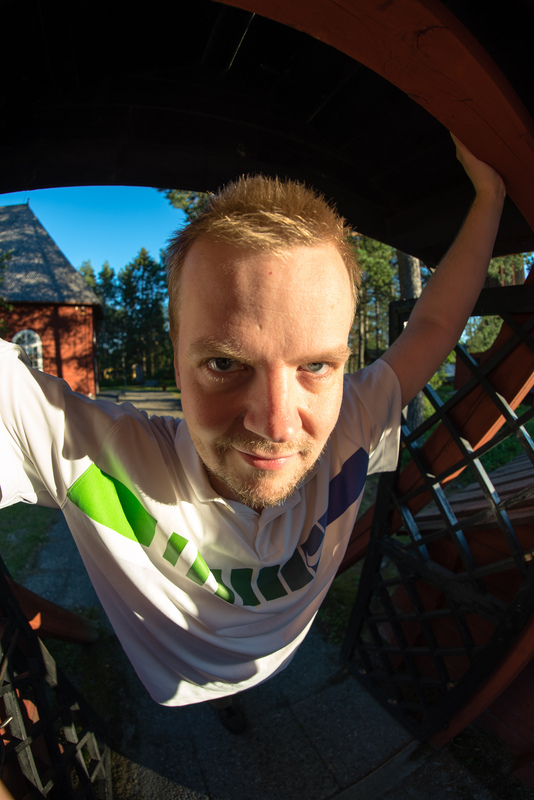 But a while ago I bought a Samyang 12mm/f2.8 fisheye, and I think it’s absolutely hilarious. First, it’s so wonderfully wacky and secondly, it’s a pretty damn good lens overall. I’ve often said that it’s impossible to take a boring photo with this lens. Bad photo? Hell yeah. Boring? Nope, that can’t be done. With a crazy fisheye like this, everything is hilarious and interesting, even if the photo is crap. To me, this is a fun, creative toy. It’s mostly useless for “serious” photography, but it’s a lot of fun shooting with it. Since the distortion is so crazy, you can abuse it to take bizarre portraits of your friends, as demonstrated below with the help of an old friend. In the photo to the left, taken at closest focusing distance for this lens which is a little more than 20cm, his face is almost pressed against the camera. It is really shoved into his face, you can’t be shy with one of these lenses. The one on the right is a little more sane, but his face was maybe 30 cm from the lens. 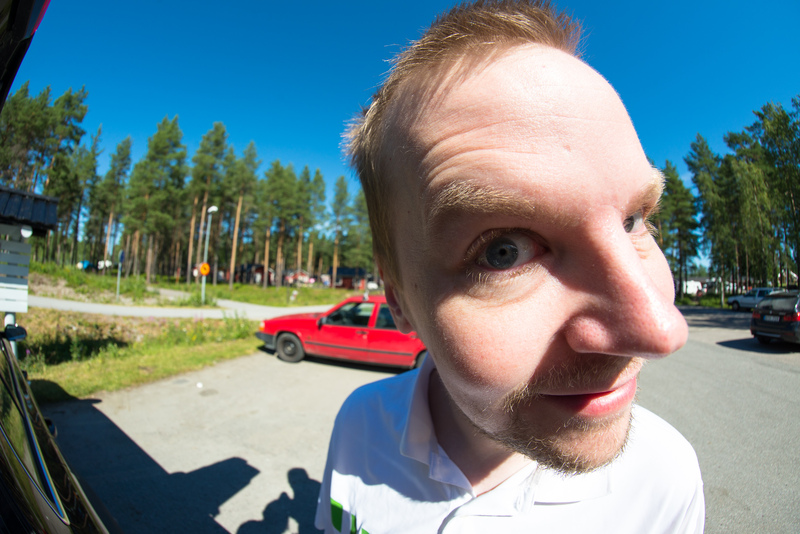 If you treat a fisheye right, you can use it for a variety of less laughter-inducing purposes. 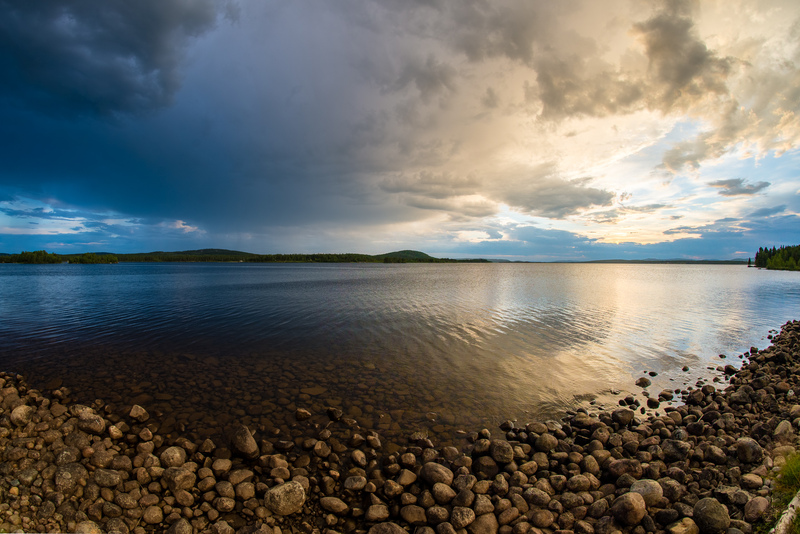 Landscape photography is one, if you make sure the horizon is fairly vertical and don’t have a bunch of trees at the outer edges, no one will know you used a fisheye. Another possible use is for interior photography. 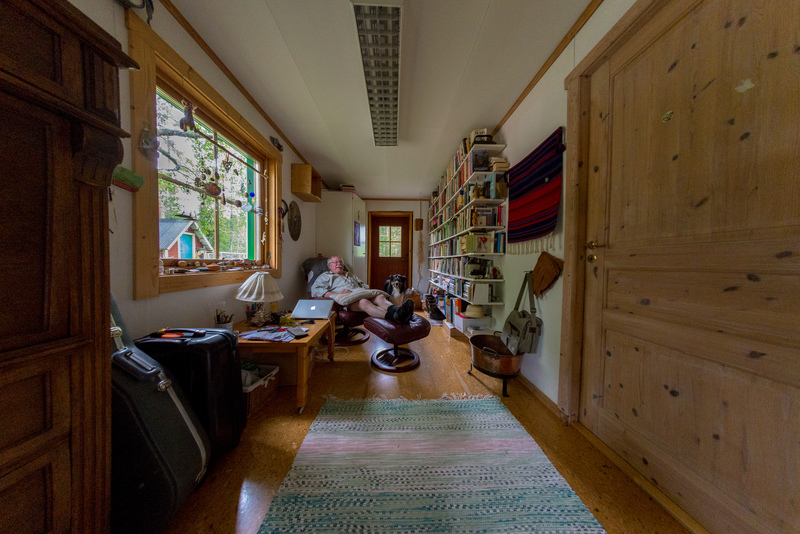 This is not optimal though, you need to perspective-correct the photos afterwards so the rooms don’t have that hobbit-y look. This unfortunately throws away a lot of the photo – but in a pinch it might do the trick. Below are the same photos with the same editing. The difference between them is the one on the left has been perspective-corrected in Lightroom. Note how it cuts off the door on the right, as well as making the perspective so much more long. The hallway seems to be several miles long, but in reality I shot it about two meters from where my dad is sitting in his chair, chuckling. 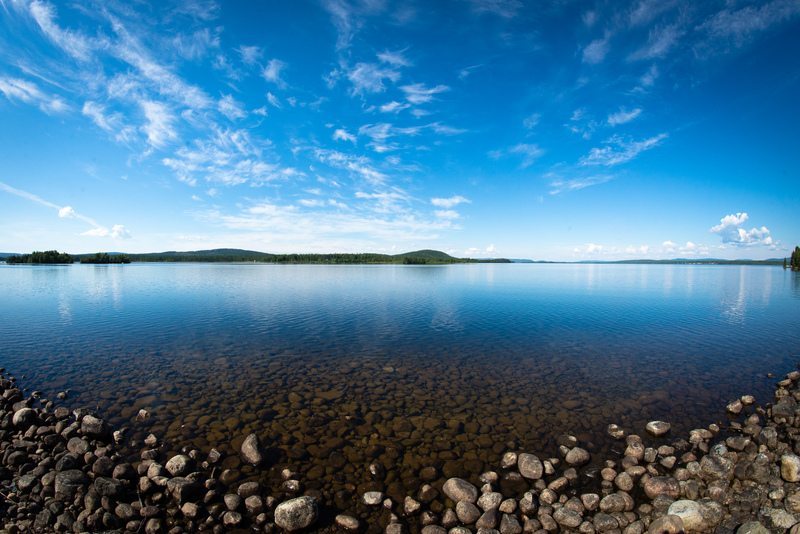 To me, there’s no mystery why some photographers and filmmakers love extreme wide-angle lenses. It makes everything seem distorted and surreal, even when you use a rectilinear lens and not a fisheye. Should you get a fisheye? If you like that wild, distorted look then hell yeah. Samyang makes a variety of fisheyes for all kinds of mounts and formats. 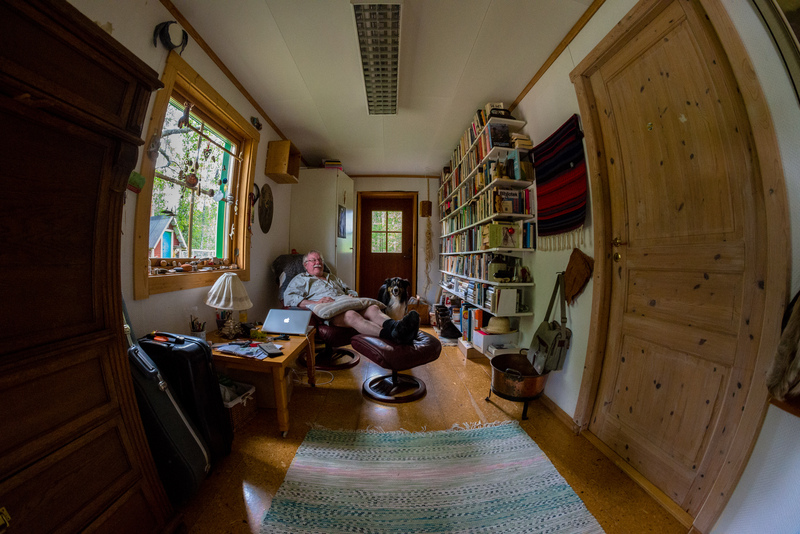 The 12mm/f2.8 that I bought is excellent and blasts even Nikons own fisheye out of the water.